The Ascension Lutheran Soup Kitchen serves a free, hot meal every Tuesday from 11:30-12:30 at Ascension Lutheran Church in Luther Hall, the lower level fellowship hall. Everyone is welcome to attend and join us for lunch, served in a dignified, restaurant-style setting. Volunteers are always needed to help with a wide variety of tasks at the Soup Kitchen, from serving guests at a table, cleaning up afterwards, to picking up donations from local donors. Please see the Soup Kitchen page for more information. 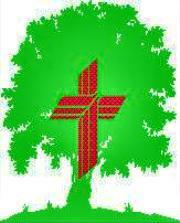 The Lutheran Women's Missionary League (LWML) is the official women's auxiliary of The Lutheran Church-Missouri Synod. For 75 years, the LWML has focused on affirming each woman's relationship with Christ, encouraging and equipping women to live out their Christian lives in active mission ministries and to support global missions. The Chapel for the Deaf is a mission of Circuit 15 (LCMS Charlotte Region) that meets at Ascension Lutheran Church in the Chapel on Sundays for fellowship at 9:30 AM and worship at 10:30 AM. Services are signed in American Sign Language by Pastor Michael MacDonald. Abundant Life Lutheran Church is a mission of Circuit 15 (LCMS Charlotte Region) that meets at Ascension Lutheran Church in the Chapel on Sundays for worship at 11:30 AM and Bible study at 12:30 PM. Services are led by Pastor Christopher Stout, intended primarily for those who are visually-impaired. The Abutment Group is a support group for people who have the dual diagnoses of addiction and mental illness. Attendance is limited to those with the dual diagnoses of addiction and mental illness. No guests or visitors please. The Abutment Group meets twice weekly in the Brick House: Wednesdays at 8:00 PM and Sundays at 6:00 PM. This particular group meets on Tuesday evenings at 7:30 PM in the Brick House, and it is only for men. For a list of other AA meetings throughout the Metrolina region, please visit www.charlotteaa.org. Crystal Meth Anonymous is a fellowship of people who share their experience, strength and hope with each other, so they may solve their common problem and help others to recover from addiction to crystal meth. CMA meets on Mondays at 7:00 PM in the Brick House. The Charlotte Chorale, a premier choir in Charlotte is comprised of auditioned singers who wish to enrich local communities by sharing the joy of song.